Background: ADA as N-(2-Acetemido) iminodiacetic acid has been widely used in preparation of organic buffers and protein-free media for fibroblasts as chelating agent chicken embryo fibroblasts as tridentate chelating agent ligand. However, a little attention has been focused to the behavior of its oxidation in aqueous acidic solutions. 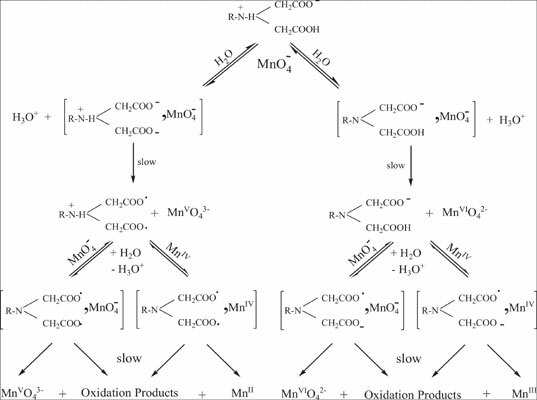 Accordingly, a lack of information on the aqueous chemistry of oxidation of ADA in acidic solutions was recognized. Therefore, we have prompted to undertake the present work with the aims at shedding more light on the behavior of oxidation and the nature of oxidation products. Again, it aims to compensate the lack of information about the aqueous chemistry of ADA and the nature of electron-transfer for redox reactions involving permanganate ion as a multi-equivalent oxidant. Method: A spectrophotometric investigation of oxidation of ADA by permanganate ion in aqueous perchlorate solutions has been investigated. Results: Absorbance-time curves indicated the presence of two distinct stages for the oxidation process. The experimental results indicated a decrease in the reaction rates with increasing the [H+], ionic strength and F- ions. Again, the reaction rates were found to increase with increasing the added Mn2+ and temperature. Conclusion: These results indicated that the oxidation process was of acid-inhibition nature and proceeding by free-radical intervention mechanism. Again, the reactive species in the fast second stage was the Mn4+ species formed in the initial stage. The activation parameters have been evaluated from the temperature dependence of the rate constants. A tentative reaction mechanism was suggested for such redox reaction. ADA, electron-transfer, kinetics, mechanisms, oxidation, permanganate, reduction.